Criminologist Professor Elizabeth Yardley discusses the relationship between violent crime and social media use, ahead of her new research being published later this month. Originally published by Birmingham City University on 15th September 2017. On Easter Sunday earlier this year, 74-year-old Robert Godwin Senior went out for a walk in east Cleveland in the US state of Ohio. It was a sunny day and he was making the most of the pleasant weather as he waited for his Easter dinner. It was during this walk that he would be ruthlessly shot dead in the street. Most homicide victims know their killers but not this time – this was a chance encounter with a man who intended to do fatal harm. His killer had been making videos of himself as he drove around the streets of Cleveland that day. In one of these videos the man is heard to say “I found somebody I’m about to kill”. He then pulled his car over to the side of the road, commenting on his plans. “I’m about to kill this guy right here. He’s an old dude,” he said as he walked towards Mr Godwin, who was on his own and walking along on the path. “Can you do me a favour?”, the man asked Mr Godwin before asking him to say the name of a woman. “She’s the reason this is about to happen to you”. He then shot Mr Godwin dead. This video, and several others, were uploaded to the social networking site Facebook. This is one of many cases in recent years in which a perpetrator has posted about a homicide they’ve committed on social media. The killing of television news reporter Alison Parker and cameraman Adam Ward in August 2015 was accompanied by similar behaviour by the perpetrator. Why do people do this? What is this all about? Are these people extreme narcissists, desperate for attention and notoriety or is there more to it than this? These are just some of the questions I set out to explore in the research covered in my new book – Social Media Homicide Confessions: Stories of killers and their victims. I examine the case of Jennifer Alfonso, murdered by her husband following a relationship characterised by coercively controlling and abusive behaviour. After shooting her in the kitchen of their Miami home, her killer posted a picture of her body on Facebook, accompanied by a statement claiming that she had been abusing him. In this statement, the killer also referenced his ‘fans’ and said they would see him in the news. I also consider the familicide in which Shelly Janzen was killed by her brother, who then went on to kill his wife Laurel and daughter Emily. Before taking his own life, their killer posted on Facebook, confessing to killing Shelly, Laurel and Emily and explaining that Emily’s chronic migraines were the reason for the familicide. The murder of Charles Taylor is the third case I explore. Charles was killed by the former wife of his late son Rex. After the murder, she posted images and statements on a variety of social media platforms. This included a photograph taken by her male accomplice, in which she can be seen holding a knife and Charles’ dead body is in the background. This image was uploaded to her Tumblr blog and sent to a friend who ran a website about serial killers. She made several Facebook and Instagram posts whilst she was on the run, many of them blaming Charles for Rex’s death. I spent several months exploring not only the homicide-related posts, but also how the perpetrators had used social media more generally in the years preceding the killings. Social media was a platform to tell stories about their lives and the social roles and identities they occupied. It was a space in which they revealed their expectations about other people and how they should behave. They also performed their membership of social groups and institutions via social media. These performances were aspirational ones – presenting their lives in highly idealistic ways, concealing the realities that contradicted these idyllic imaginaries. Visibility was a weapon that they used to tackle the struggles and challenges of everyday life. It was also a tool they used to manage their transgressions as killers. They used social media to protect them from the consequences of accepting their realities and maintaining their fantasy idealistic identities and practices. This fetishistic disavowal (Žižek, 2009) served to conceal the negative aspects of their identities and amplify the valued roles and behaviours that gave them status. Whether they embraced the identity of the killer, tried to claim victim status for themselves or accepted responsibility for their actions, social media enabled them to position themselves as particular characters in their stories of homicide for others to consume. Several gatekeepers stood between the killers of the past and those who consumed their stories. Mainstream media organisations decided which cases were newsworthy and as such, which cases would enter the public consciousness. Whether the killers of the twentieth century would be seen or unseen depended on the judgements and decisions of other people. If these stories did emerge, they did so second-hand, mediated and edited, the perpetrator’s control of the story diminishing with every filter it passed through. However, the tables have now turned, today’s killers can share their stories of homicide in their own words at the tap of a touchscreen. This has enabled them a degree of control over the narrative that they have not previously experienced. Social media enables these killers to show themselves and their victims in ways they want to be seen. Perpetrators both create and represent the homicides they commit. They go from consumers to producers, their content particularly marketable in ‘wound culture’ of public fascination with violent crime (Seltzer, 1998, 2007). The confessions I explored were not bizarre, one off aberrations but patterns of entrenched behaviour. Just as individuals don’t suddenly snap or change when they kill, neither does what they do with networked media. In a world where to be is to be seen, this is not going to change. As criminologist Steve Hall notes, ‘the terror of insignificance, of remaining unrecognised by others, might now reign supreme as the most potent and extractable source of human energy’ (2012: 172). Criminologists, social media companies and law enforcement all need to realise that the online and the offline are not separate. We now live in a world where real, embodied, visceral violence is performed and consumed on social media. We need to start making better sense of how people live within these seamless spaces if we are to tackle homicide in digital culture. Hall, S. (2012) Theorizing crime and deviance, London: Sage. Seltzer, M. (1998) Serial killers: Death and life in America’s wound culture, New York, NY: Routledge. Seltzer, M. (2007) True crime: Observations on violence and modernity, New York: Routledge. Žižek, S. (2009) Violence, London: Profile Books. 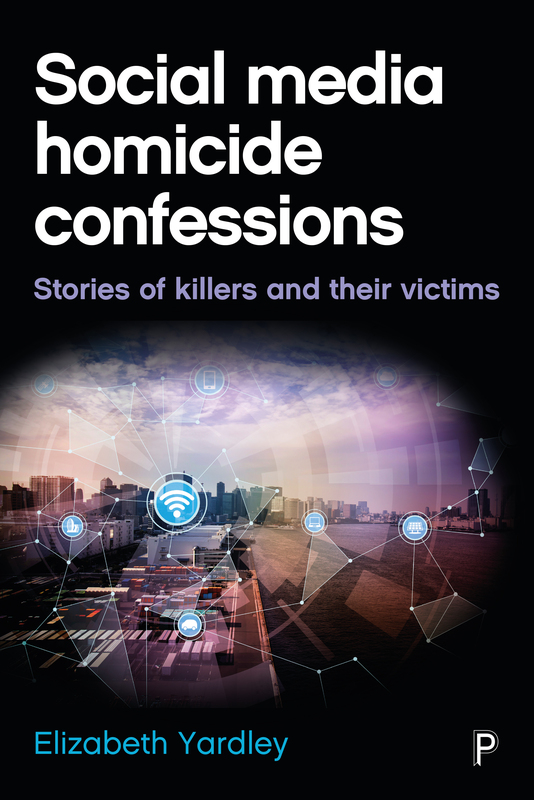 Social media homicide confessions by Elizabeth Yardley is available with 20% discount on the Policy Press website. Order here for just £19.99.